Figure 1: Simulated axonal tree of a dopamine neuron (Hunger and Schmidt, unpublished). Dopamine is a neuromodulator in the striatum of the basal ganglia. It plays a role in reward-related learning and motivation (Pan et al., 2005; Pan et al., 2008; Hamid et al., 2016). In Parkinson’s disease many neurons that release dopamine in the striatum die, which leads to severe motor symptoms. Addictive drugs (e.g. cocaine, amphetamine) strongly affect dopamine signalling in the striatum. We are trying to find out how dopamine acts on neurons in the striatum and on their inputs from cortex and thalamus. To do so, we use a variety of computational models. 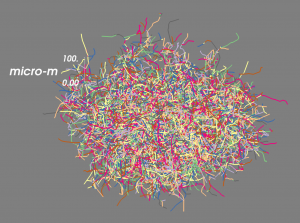 For example, we simulate the growth of axonal trees of dopaminergic neurons in the striatum (Figure 1). Based on such axonal trees we can then determine release sites from which dopamine is released into the extracellular space in the striatum. We have simulated how the released dopamine then diffuses in a 3D cube of striatal tissue over time. Figure 2 shows a 2D snapshot (i.e. a slice of striatum) at one time point, with the yellow blobs showing areas with a lot of dopamine. 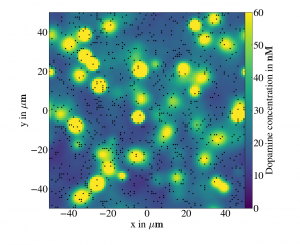 Figure 2: Simulation of dopamine diffusion in the striatum (Hunger and Schmidt, unpublished). The black dots mark dopamine release sites. We use these simulations to find out how activity of dopamine neurons affects the concentration of dopamine in the striatum. Is the amount of dopamine very homogeneous across the striatum or are there temporal and spatial patterns? Furthermore, we can simulate Parkinson’s disease by removing axons from the simulation. This might yield important insights into impaired dopamine signalling underlying some of the motor symptoms of the disease. Finally, we can also simulate the effect of various drugs. For example, cocaine reduces the re-uptake of dopamine, which increases the overall dopamine concentration.